According to the reporter who obtained the picture, the area is not used for airplane flyovers due to its characteristics. 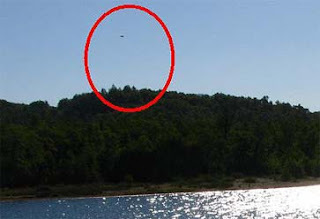 An Unidentified Flying Object (UFO) was photographed by a reporter for regional newspaper ZonaLacustre.com as he covered the event involving the Reigolil statement, where Curarrehue is promoting the opening of the mountain pass on a permanent basis. It was only upon reviewing the photos taken in the vicinity of Lake Pilhue, on the Argentinean side, that it was possible to see an object flying in the blue skies. Upon enlarging the digital photograph, it became possible to see a rounded object of uncertain origin. The object cannot be seen in other photos taken at the same spot with only seconds difference. It was no longer seen after it was over Lago Pilhue. According to this communications medium, "its impossible for it to be a commercial aircraft or of another kind, as this area is not employed in flights by being a border region and with no air corridors. Furthermore, had it been an airplane, its engines would have been heard," they explain. "It's quite common for residents of our country's cordilleran regions, particularly in southern Chile and Argentina, to remark about the strange lights that can be seen at night. The do not come from vehicles, as no roads exist in the areas where they have been seen," summarizes the news item.